Hoping for Change | Idealist Girl! I left the Catholic Church a while ago. I could no longer reconcile my sense of spirituality and the divine with the deeply-rooted misogyny and the perversion of sexuality that I saw at work within the Church. I know some people can work for change from within, and I admire their ability to do so. For me, I had to choose life and love over bitterness and frustration. However, all those years of Catholic school and a year spent in the Jesuit Volunteer Corps is too much Catholicism to write off. Out of personal curiosity, I still pay attention – at least a little – to the workings of the Catholic Church. And because I always have at least one social-justice-type endeavor going on, I pay attention to what the Church is doing because its reach is so far. One man, one pope with vision, could change the world. I just hope it’s for the better. 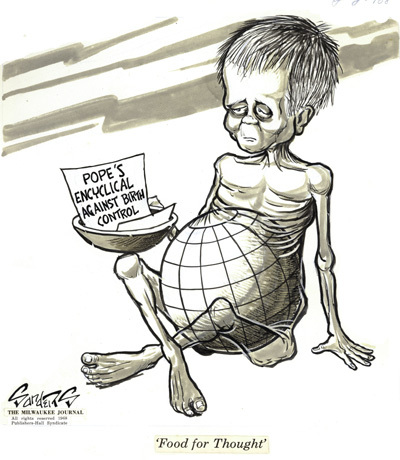 Currently there an estimated 1.2 billion Catholics world-wide, with over 50% of those living in developing nations. The new pope is from one of those nations – Brazil – and as such has probably seen more poverty and human right violations first hand than the last 10 popes put together. I find it incredibly hopeful that this pope truly cares about the poor and that he has devoted so much of his service to ministering to their needs. If he can bring that sense of social justice to the front and center of the Vatican, the Catholic Church will be in for a reordering of priorities that is long overdue. However, if Pope Francis does not address the status of women as a significant factor in poverty and injustice, then he will do no better for the Church than his predecessors. Educating women and permitting them to choose the timing of and size of their families is tantamount in eradicating poverty, maternal and infant mortality and a host of other social ills. According to Population Connection, the 50 poorest countries in the world are the ones with the highest birth rates. High birth rates and poverty are entangled in a tragic cycle – those too poor to afford birth control have larger families, which in turn leads to deeper poverty with even less money to access birth control. Last year, I read a heartbreaking article in the Los Angeles Times detailing the effects of the elimination of birth control from public health clinics in the Philippines. With heavy pressure from the Vatican, lawmakers stripped funding from the public health clinics, so that only women with the means could purchase birth control. Despite 70% of the population in this largely Catholic country supporting access to birth control, it remains out of reach to all but a minority. Women – married and unmarried alike – are subjected to repeated pregnancies until they have more children than teeth. Their daughters become mothers at tender ages, and the cycle continues. Most of these women live completely hand-to-mouth, struggling to sell small items each today with the hopes of cobbling together a meal for their family. It is a brutal existence. Maternal and child mortality rates are high. And it doesn’t need to be this way. Across the developing world, the story is the same. The LA Times estimated that some 222 million women worldwide want access to birth control but cannot obtain it. The intersection of poverty and religion, as evidenced in the Philippines, is often a cause. When religious leaders use their powers to make birth control more widely available, birth rates drop dramatically. Take Iran. In the 1980s, the Ayatollah de-stigmatized birth control and made it more widely available. Since then, the birth rates have dropped from seven children per woman to fewer than two. Increasing numbers of families have the resources to educate their daughters. Growing numbers of these daughters are completing college. When they have children, those children are not born into abject poverty. Maternal mortality rates are significantly lower than in the Philippines (21 vs. 99 per thousand). Study after study shows that increased education of female children leads to lower fertility rates. Likewise the fewer children a family has, the more likely they are to be able to afford to educate their daughters. As families with fewer children are often able to better provide for those children, and as increased levels of education often helps families increase their income, the connection between access to birth control and alleviating the suffering of the poor cannot be overlooked. Which is where Pope Francis comes in. Currently, he seems bent on upholding the Catholic teachings against birth control. However, as he comes to understand the power that he has to relieve the burden of poverty amongst the world’s poorest faithful, it is my strong hope that he will choose to steer the Catholic Church in a new direction. It will be a painful transition. But for the sake of families across the world, families who desire more than subsistence living, children who want to reach adulthood with a living mother, girls who yearn to complete their education and engage in a full public life, I hope that Francis will be brave enough to lead his flock through the transition and into a bright new future. It would be the Church’s strongest affirmation yet that women do in fact have a “fundamental role” in the life of the Church, and indeed the world.